I love the smell of Clary Sage, and I know when I am feeling irritable and in pain during my menstrual cycle this is the oil I will grab to help me out a little. In saying this, I am always cautious when using it because it is very powerful and can be quite overwhelming if used in large quantities or in rooms that are not well ventilated – such as in the birthing suite. 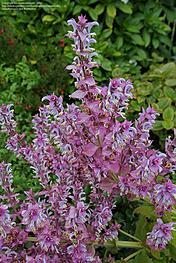 Clary Sage is a plant native to Italy, Syria and Southern France and grows in dry soil. The essential oil is distilled from the flowers and flowering tips and is not to be confused with Sage. Clary Sage is such a versatile oil with a high concentration of esters and has many properties such as anticonvulsant, antifungal, antiseptic, antispasmodic, astringent, nerve tonic, sedative and warming. Some users have actually had the sensation of feeling “high” after using Clary Sage and it has been known to cause headaches if used for too long. This is why having it on a tissue or cloth and smelling it from time to time is far more effective and less likely to cause these side-effects. If the smell becomes overpowering you can always remove the tissue or the cloth containing the Clary Sage (I keep it in a zip lock plastic bag) – but less likely if you have used it on your body. This oil is now widely used before and during labour. Many women are told that they can use Clary Sage to induce labour, however this is a common misconception and Clary Sage cannot be used to induce labour unless your body is ready to go into labour. Nothing can induce labour until your body is ready, unless of course you have a medical induction, and even then they are known to fail, causing distress in both mum and baby, which then may lead to other interventions or caesareans. However, using Clary Sage prior to 38 weeks is not recommended just in case your body is in danger of going into premature labour. It may stimulate the release of oxytocin; therefore it is highly recommended for use during labour to help contractions to intensify and become more effective in pulling up the horizontal uterine muscles to open the cervix and move baby down into the pelvis and into the birth canal. Clary Sage helps you to have more effective contractions once you do start having them as it relaxes the mind, body and muscles. This is what is needed for mums to go into labour in the first place – eliminating catecholamines (adrenaline) and stimulating endorphins and oxytocin. By using the Clary Sage for relaxing and calming the mind, body and muscles you are more inclined to go into labour spontaneously. This wonderful essential oil facilitates birth and helps breathing by calming the lower part of the spinal cord and the nervous system. It helps labour to progress well when you put a few drops on your labour focus points (see diagram below). It can also be used to reduce pain and aid in circulation. The simplest and most common way to use Clary Sage during labour is to put a few drops onto a dry cloth or flannel and mum will inhale the aroma when she needs it to help herself become more calm and relaxed during contractions. 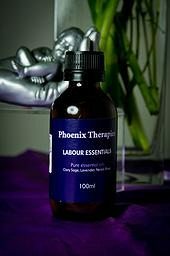 You can also add a drop of Clary Sage to the inner ankle on the labour focus points (Spleen 6 – SP6) to help stimulate the contractions and to ensure that the labour is progressing well. Another effective way to use Clary Sage essential oil is to put a few drops onto a couple of cotton balls and put them under your pillow. The aroma will eventually make its way through to your olfactory system and will have many benefits such as relaxation, reducing muscle tension, calming the nerves and increase effectiveness of contractions of the uterus. Massage with Clary Sage with other essential oils can also be really calming. Make up a massage oil using 15 drops of Clary Sage oil in 50ml carrier oil and massage gently around the abdomen, hips, lower back and pelvis. This is a great way of introducing the oil into the body. Clary Sage oil can also be added to a bath for a relaxing soak, although not into your birthing water as baby’s skin is very sensitive and most baby’s are born with their eyes open, so I wouldn’t recommend putting any essential oils into your birthing pool. When using Clary Sage essential oil during labour and birth, this can also aid in releasing the placenta, so the mum should continue breathing in Clary Sage. Some caution should be taken when using Clary Sage, and my best advice is to never take Clary Sage orally as has been suggested in some forums I have been on. Always remember, every woman is different and what works for one, may not work for the next. Rose is a uterine relaxant and helps the ligaments to soften, enabling the pelvic bones to expand, and also to regain elasticity after the birth. Neroli works on the nervous system and facilitates easy breathing, especially during labour. Its calming effect increases the oxygen supply to the blood and brain and helps the woman to avoid hyperventilation. Lavender helps to stimulate circulation and has a very calming effect on the mother. Clary Sage is highly regarded as a uterine tonic and used to promote calming while stimulating the uterine muscles and provides pain relief. 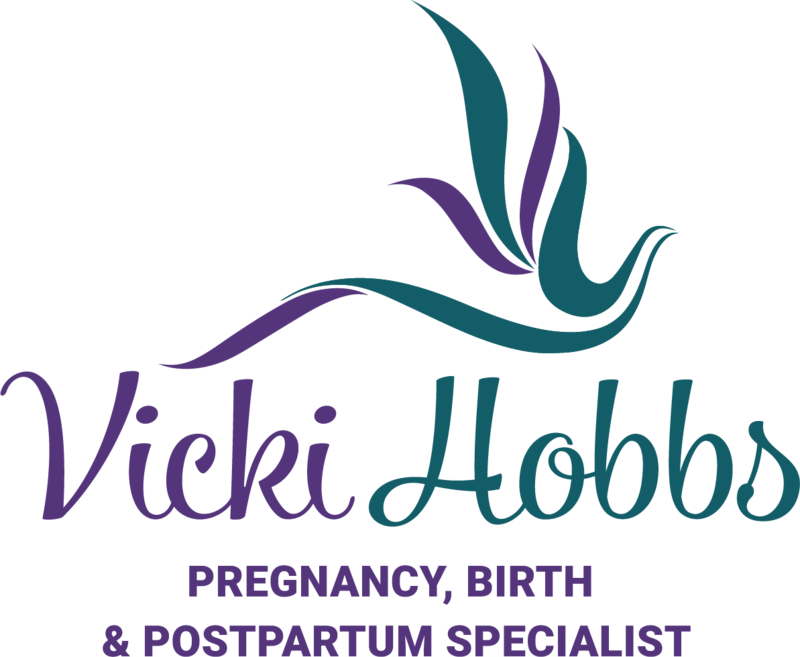 For more information about using essential oils safely during pregnancy, labour and birth and beyond you can download my free Aromatherapy Used in Pregnancy, Labour, Birth & Postpartum Handbook.